The montane forest region of central British Columbia and western Alberta is one of the warmest and driest ecoregions in Canada. Elevation, aspect and fire play an important role in shaping these forests, which can have an open, park-like setting. 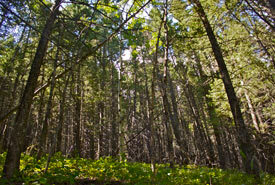 Characteristic species include Douglas-fir with lodgepole pine trembling aspen, with white spruce in cooler micro-climate in valley bottoms. In 2012 the Nature Conservancy of Canada (NCC) conserved Lusicich, a 260-acre (106-hectare) property located west of Coleman along the north shore of Crowsnest Lake.